A little explanation is in order. 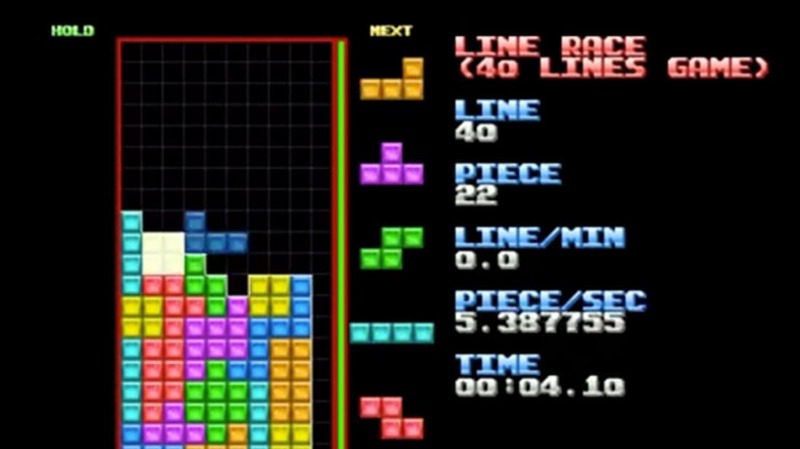 This is what's called a Tetris "line race" (also known as a "sprint"), in this case an attempt to clear 40 lines in the minimum possible time. This is the kind of thing top-level Tetris players do when they're bored, and/or want to prove that they are truly the best in the world. The player here is a Japanese woman player* who goes by "Keroco," and he or she achieved 40 lines in 19.68 seconds. That's the first time that someone has broken the 20-second barrier, and it's astonishing, to say the least. (A few years back, 40 seconds was considered a great time.) Tetris champion Ben Mullen wrote of the feat, "Let me humbly submit that this may be the greatest achievement in the history of gaming. ... This won't make national news. But to be honest, it should." For more on the achievement, read this Reddit thread and focus on the bit by Kitaru (Alex Kerr), a Tetris Grand Master. If you're into tech, check out this Hard Drop page which includes a link to the replay file. If you'd like to see Keroco's journey to achieve this record, check out Keroco's YouTube page, which shows ten months of progressively faster games. * = Update, 19 August 2013. Apparently there is some disagreement about whether Keroco is male or female, so I've updated this article slightly. If this Tetris is a little too fast for you, slow down with Playing to Lose, a feature article I wrote about competitive Tetris earlier this year. It includes no video, and will not make you freak out. I promise.